Dublin is more than a team. Dublin is a fountain of football, a holy well pumping out the water of life. The boys in blue are a unifying force in a city that never weeps. Dublin have been the best team in Ireland for some time now. And maybe forever. Dublin win the four-in-a-row and so many of these young lads have so little mileage up. That will do you now, Billy. Enough. But Dublin are so good, hyperbole has become the ordinary language of everyday talk. The old-school essays nearly always started with the line "the sun shone in a cloudless sky." And so it was in Croke Park when the sun shone for Dublin yesterday. The day was made for good football and the football was very good. Tyrone missed some scores but they too performed brilliantly at times. The ground was summer-hard and it suited Dublin. The surface was perfect. The Pope left the place as he found it. Four-in-a-row done - and the fifth is as good as won. But Kerry own the five minors in-a-row. Several of these boys, and boys they still are, will make the big time but by then Dublin could be on nine or 10. Fair play, The Hill gave our kids a huge round of applause. Dublin had so many stars. Jack McCaffrey is faster than turning on the light, and as smart as an iPhone. Paul Mannion saved a goal by backtracking at pace and scored several points. He is a man for all jobs and a master of every one. Cormac Costello comes on and after a powerful run, he hits the post. Costello must be the first replacement ever to be in line for Footballer of the Year. Con O'Callaghan would mahout an elephant through the turnstiles. He's a man for the gap. 'Molly' was sung heartily a long way out but Tyrone never gave up. The Hill was infiltrated by platoons of the Red Hand, and one whole section was full of Tyrone fans. It was as if Donald Trump's soldiers were marching behind the North Korean nuclear missiles. But the battle for Hill 16 only really got going when Colm Kavanagh was pulled down for a penalty. Colm was screaming for the ball at the edge of the goal. On came another big man Richard Donnelly, who should have started. 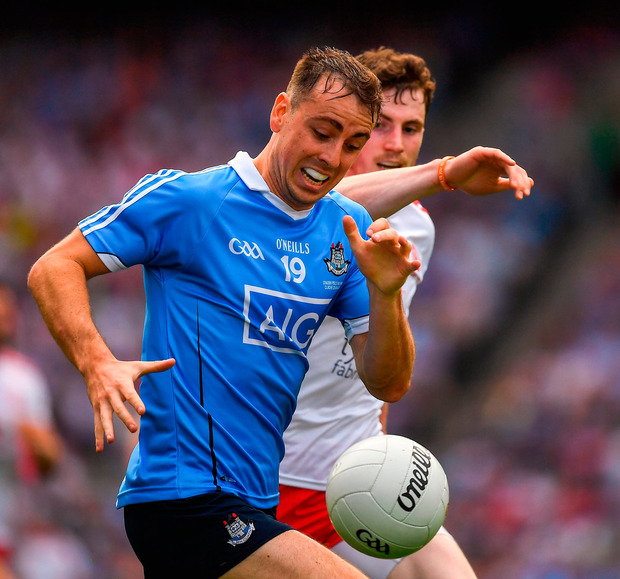 Dublin were anxious and Tyrone were reborn. But then Dublin took over again. Stephen Cluxton sent two express deliveries to beat the kick-out press. The finishers finished off Tyrone and Dublin won the four-in-a-row. The Air Corps flew over Croke Park as retired Commandant Jim Gavin flew Dublin to glory. Dublin owe Jim a huge debt of gratitude. His team has ensured that Dublin, our biggest city, will celebrate tonight like a village. Mickey Harte's daughter Michaela is laid to rest in Ballymacilroy cemetery in her beloved Tyrone. I'm sure Mickey called to see Michaela in the days before the game and no doubt he will have a chat when he gets back home. Mickey's faith has always given him the strength to carry on. And carry on he will. Tyrone played for him and their people. I am sure Michaela was here in Heaven's Annex. The city's Angelus bells are ringing now in praise for the city's sons. We in Kerry salute you and yearn for our lost Kingdoms. Will it stop at five? Dublin are superbly organised as a county. Dublin have their affairs in order. And fair play to them for that. The young kids are playing the game and these modest Dublin players keep their medals in the sock drawer. They are the best of winners and a character reference for their city. Their motivation is to make their own people happy and good. The Dublin lads are not only good footballers, they are good men. Philly McMahon's brother John died from drugs. Philly was out there in Croke Park and he has saved lives, by just being himself. He is articulate, honest and intelligent. I have to mention Bernard Brogan who won his sixth. Bernard suffered a terrible injury back in January, but he never gave in and came on against Roscommon. That's 10 in the Brogan house now, only six behind the Spillanes. It's 100 years since the great Wexford team of the First World War won their four-in-a-row. And they lost the two finals before that. Jimmy Deenihan lifted the cup for Kerry's four in 1981 and we could have won more in-a-row but for a few unfortunate interventions. But that was yesteryear and the years before that. The Dublin of today are very much alive, alive oh. These four Dublin teams have entered through the gates of greatness, and their honours are chronicled in the annals of the immortals.